The Colorado Plateau is one of the most magnificent areas in the United States. Straddling the border of Arizona and Utah and set on a high plateau of Navajo Sandstone it contains some of the most spectacular locations to be found anywhere. The area contains some of America’s most spectacular National Parks and these include the Grand Canyon, Zion, Cedar Breaks, Bryce, Escalante Grand Staircase, Capitol Reef, Canyonlands and Arches. 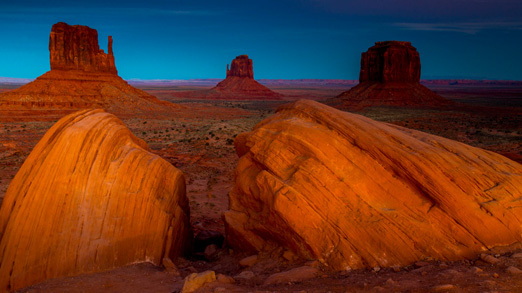 There are many more outstanding locations to be found such as Red Rock Canyon, Horseshoe Bend, Antelope Canyon, Lake Powell, Devils Garden, Goblin State Park, Cedar Mesa, the Goosenecks and the most famous of them all Monument Valley. Our winter tour will include all these and much more of this amazing area. Our visit to the Canyons begins in Phoenix. 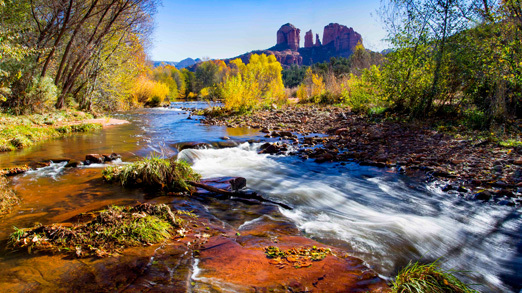 From there we drive north to Sedona where we will visit Oak Creek to photograph the towering Cathedral Rock before travelling along Oak Creek Canyon to Flagstaff and then onto the Grand Canyon. At the Grand Canyon we will stay overnight at the South Rim allowing us to enjoy the evening and dawn light along the canyon rim. Our journey then takes us north to Page, an area with many wonderful photographic locations. 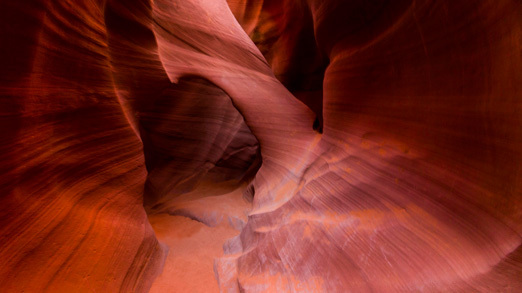 These include the amazing Upper and Lower Antelope Canyon, Horseshoe Bend, Lake Powell Dam and of course Lake Powell itself. We will take photographs at all these locations and you will have the opportunity to enjoy an optional boat ride on the lake. Our journey then takes us to Zion National Park. Zion with its peaks towering above the Virgin River offers a fabulous location for mountain photography. As we enter the park we can explore the amazing sculpted landscape on our drive to the valley floor. The famous Checkerboard Mesa is just one of the great photographic locations along this route. In the valley floor we can catch the shuttle up to Temple of Sinawava and enjoy the sheer cliffs as they tower over the valley floor. From Zion we journey north to Bryce Canyon with a short detour to visit Cedar Breaks, if the conditions allow, as this area is often covered in snow at this time of the year. We will stay overnight at Bryce Canyon timing our journey to arrive for sunset. An early start for the next two mornings allows us to enjoy the sunrise over Bryce Canyon. The early light will make the hoodoos glow red and the crescent shaped valley floor is something to behold. We spend the morning exploring along the canyon rim and in the afternoon, we take a hike down the Navaho Loop Trail before returning to the rim for sunset. The following morning, we witness sunrise from Bryce Point before heading east through the Escalante Grand Staircase National Monument. We take a detour to Devils Garden before climbing high above Boulder and over the 9,200 feet Boulder Pass to Capitol Reef. We enjoy the morning in the park before heading to Hanksville for our evening visit to the Goblin State Park to capture this amazing place in the evening light. From here we head into Arches and Canyonlands National Parks staying in Moab. After time visiting those spectacular locations we head south and visit the Goosenecks of the San Juan River before we reach Monument Valley. Here we will witness the sunset over the valley and take a morning ride into its heart with the Navajo Indians. We continue south to Flagstaff via the Little Painted Desert before ending our tour as we journey south to Phoenix via the old mining town of Jerome.